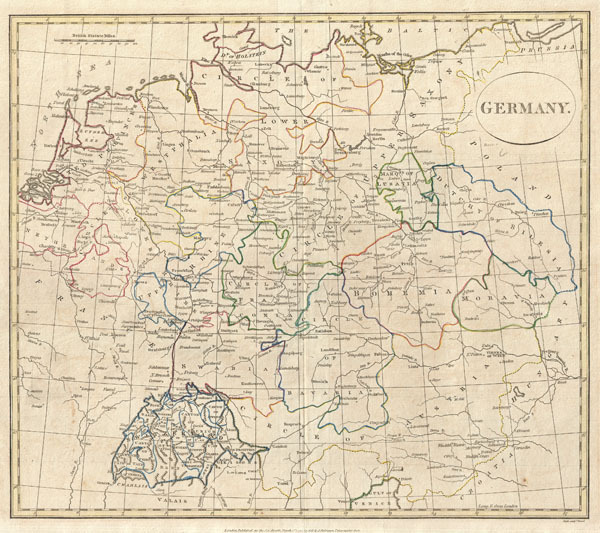 A fine 1799 map of Germany by the English map publisher Clement Cruttwell. Includes the regions of Westphalia, the Upper and Lower Rhine, Circles of Upper and Lower Saxony, Lusatia, Dutchy of Silesia, Moravia, Bohemia, Swabia, Circle of Bavaria, Circle of Franconia, and the Circle of Austria. Switzerland appears in the south. Includes rivers, political boundaries, important cities, ports and gulfs. Mountains and other topographical features shown by profile. Outline color and fine copper plate engraving in the minimalist English style prevalent in the late 18th and early 19th centuries. Drawn by Clement Cruttwell and published in the 1799 Atlas to Cruttwell's Gazetteer.